OMG you guys, is everyone drowning in exams/grading/spring cleaning/filing tax returns/fearing layoffs around here or what! April has traditionally been a crazy time in my life -- since my parents are both accountants, my Aprils of Yore have been filled with 10pm dinners and sneaking in from the bar* at 2am trying not to make noise, not realizing my parents weren't even home from work yet. But lately, all my craziness seems to have been stuffed inside a suit case. In that I've been traveling rather a lot. And while I generally love traveling, I don't like not having my *stuff* around me. You can imagine that being the person I am, and writing the blog I write, I have approximately a metric crapload of beauty *stuff* that I consider "essential". And while travel versions are all fine in theory, I secretly hate that they are so inferior to the real deal. Short stubby makeup brushes that poke and scratch? Who cares if you fit in my carry-on clutch if you're going to make makeup application such a painful, tedious process? Thank goodness there's EcoTools. I'd hear that they came out with a retractable kabuki brush a while back, but due to the EcoTools shortage in Toronto, I had to wait until a Buffalo trip to pick one up. But oh boy is it ever worth the wait! Housed in a cute, neat, aluminum shell, this kabuki is both compact and luxurious. It feels just as good as my regular Lumiere kabuki, with soft, dense, gentle bristles that are perhaps just a titch "floppier" than Lumiere's. No perceptible difference in performance though -- mineral powder glides on smoothly and effortlessly, and when I'm ready to pack up and go, the bristles slide neatly into their case. No dusty brushes, no bent hairs. Love! EcoTools can be found at drugstores & discount department stores everywhere in the US, and at London Drugs in Canada. [EDIT: Thanks to reader E, who noticed that Zellers in Ontario carries EcoTools. I've also seen them in Wal*Mart in the past little while. Selection tends to be a bit picked over, but they're definitely there, hooray!] Check out their website for a full list of retailers. * Actually untrue. I was (am) a nerd, so if anything, during Aprils of Yore I was sneaking in from late-night cramming sessions or frenetic data analysis. The bar trips happened in March and May! Best PSA Ever: Sephora 15% OFF Coupon!!! Hello lovelies, here's a sweet deal to kick start your weekends! If you're a Beauty Insider at Sephora, you can get 15% off your entire purchase until April 21, 2009! They never do sales like this! Awesome!! This offer is good for in-store purchases only for us Canadians, but for those in the US, you can get the discount for both online and in-store purchases. For an in-store purchase, all you need to do is print off that coupon above and present it with your Beauty Insider card (your registered email address will probably work too). For an online purchase, you have to enter a code at checkout. Check your emails to see if Sephora's sent you your own code. If not, one lucky reader can use mine: BD2T9CB5. The email code seems to only work once, so shop fast, my friends! The in-store coupon, as far as I know, can be used on multiple purchases, though I have not personally tried this. Everyone gets the same in-store coupon bar code, so we can all use that one! You do need to have signed up for the Beauty Insider program prior to April 14, 2009 though. Whoooeeee! Best Friday present ever! But generally speaking, a little shimmer is a good thing. It adds depth, interest, and sparkle. It's fun and girly! So a little shimmer should help pretty much any product, right? This must have been what the folks at Cover Girl were thinking when they came up with Lash Blast Luxe Mascara. Shimmer in a mascara? Why not? People luuurve shimmer. Right? Well, maybe it's just me, but the shimmer in Lash Blast Luxe does absolutely nada. I got the blue shade (it's called the very dramatic Black Royale), which, as far as I can tell, is a black base with blue shimmer. Once it's on the lashes though, I can barely see the shimmer at all. I certainly can't tell if it 'brightens' my eyes or whatever. If I look super closely, I can tell something's there, but it sort of just looks like I was messy when applying my shimmer eye shadow and got some on my lashes. Hmm. Despite the shimmer having little-to-undesirable effects, I actually quite liked the forumla. It seems a bit drier than the original Lash Blast, which means that while it didn't create quite as much volume for me, it was much better at getting that soft feathery look. A bit softer than the regular Lash Blast, but also easier to deal with (Lash Blast original got a little clumpy sometimes, and my lashes would stick together). It stays on well, is smudge free, and I can wear it with contacts on no problem. So would I recommend this? 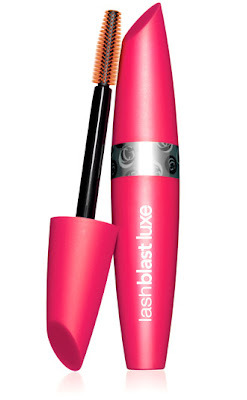 Well, if you love Lash Blast already, then you probably don't need this. But if the original Lash Blast was a bit too wet for you, or if you haven't tried Lash Blast and like the idea of having (barely-perceptible) shimmer in your mascara, then go ahead and grab a tube. It's definitely not a bad product, just don't go expecting Liza-Minelli-crossed-with-Vegas-showgirl lashes from this! * Okay, technically I guess that's more "sparkly" or "blingy". It was horrific however you slice it. Also, I totally want the Jessica Biffi Winner's dress now! Oh to have $100 extra. Or $400 extra, so I can get it in all those colours. Mmmm... sherbet-y. Hey, did you hear it's a recession out there? No kidding, huh. Even being the news-shy person that I am (I prefer the Emu Approach to dealing with depressing/alarming world events, i.e., stick my head in the sand until it's all over), I can't ignore the fact that everyone's trying to tighten the purse strings. But I've always believed that you don't have to spend a lot of money to look and feel good, and Ms. Manicure and Ms. Pedicure are here to prove my case. Nail clipper, cuticle clipper, scissors, tweezers, orange wood sticks, nail file (durable and *much* better than those orange emery boards), 4-surface nail finishing doohickey, and a nail brush. Phew! There's lots of room on the other side to hold a bunch of your favourite polishes and treatments too ('cuz you KNOW I can't go away for a week without bringing at least 4 polish shades with me. Obsession, I has it. But not the CK kind. Um, anyway...). Normally when I travel, that stuff is just chucked in a plastic bag, and I just pray and hope things won't knock around and explode. With this kit, everything is kept orderly and neat, and I can tuck it in securely between my shirts and shoes in my luggage. Oh, and did I mention the entire thing is only $10 US? TEN BUCKS! I've spent more than that on coffee in a week! I also got to try some of their pedicure accessories too. 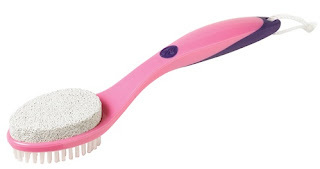 I love the Smoothy Groovy (a pumice stone/scrub combo) -- perfect for use in the shower, or to achieve a Pedicure in a Hurry. The heel cream is surprisingly good too. I honestly wasn't expecting much out of a $3 product, but it out-performs some of the higher-end drugstore creams I've tried. Creamy, sinks in pretty quickly for a foot cream, and has a subtle herbal/mint smell that isn't overpowering or stingingly fake (here's looking at you, Calgon!). And the bottle will last for months. Effective, economical, and pink... doesn't get much better than this! 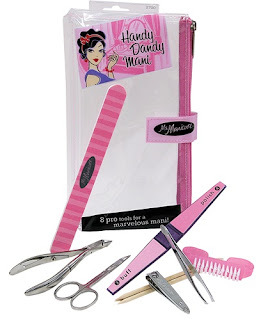 Seriously, if you are a nail-polish kind of girl, pick up a manicure or pedicure kit before your next trip, or even just to keep your tools organized at home. I personally think that the kits would make really cute bridesmaid or shower gifts as well... fill 'em with your friend's favourite polish goodies, maybe throw in a cuticle balm or a spa gift certificate... it's a present that is endlessly customizable. Plus, if you're a control-freak kind of bride, this can be a "subtle" way of telling your bridesmaids which colours you want them to wear on your big day! US readers can find these lines... well, everywhere. Check out their website for a list of retailers, but I've definitely seen them at Tar-jay. My fellow Canadians, I bemoan the fact that I haven't spotted them here, but hopefully WalMart will start carrying them soon. You lucky Brit babes can find the lines at Boots and Superdrug (I think it's such a great fit for Superdrug's decor... so pink!) Final tidbit: these fabulous tools are brought to you by the same folks who make EcoTools. Remember how much I loved their stuff? I freakin' luuurve this company! Also, look out for a new review on EcoTools later this week! * 90's and/or Bring It On flashback, anyone?